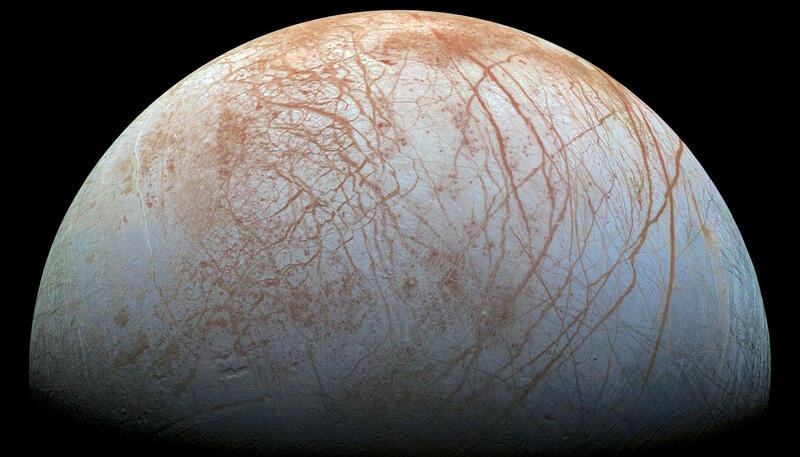 A NASA-funded seismometer under development at Arizona State University holds the promise of landing on Europa's ice shell — and listening to it. The seismometer would use Europa's natural tides and other movements to discover the shell's thickness, see whether it holds pockets of water — subsurface lakes — within the ice, and determine how easily, and how often, ocean water could rise and spill out on the surface. The ability to withstand a hard landing is a great help, says team member Garnero. "Seismometers need to connect with the solid ground to operate most effectively." Sitting on loose surface materials can isolate the instrument from seismic waves passing through the body of the moon or planet — or, on Europa, its ice shell. But, he said, "ice being deformed on a local scale would be high in frequency — we'd hear sharp pops and cracks. From ice shell movements on a more planetary scale, I would expect creaks and groans." As Europa orbits Jupiter, it gets repeated tugs from the gravity of neighbor moons Io and Ganymede. These tugs keep Europa's orbit from becoming circular and that lets Jupiter stress the shell — and then let it relax — over and over, endlessly. Thus, Rhoden said, seismometers on the surface should detect any ongoing activity in the shell.